Throughout the year, any tart fruit can be substituted in for the rhubarb. This is really easy to make and goes a long way – extending fruit across multiple desserts. The feature picture includes a shortbread cookie, an optional element you can choose to omit. 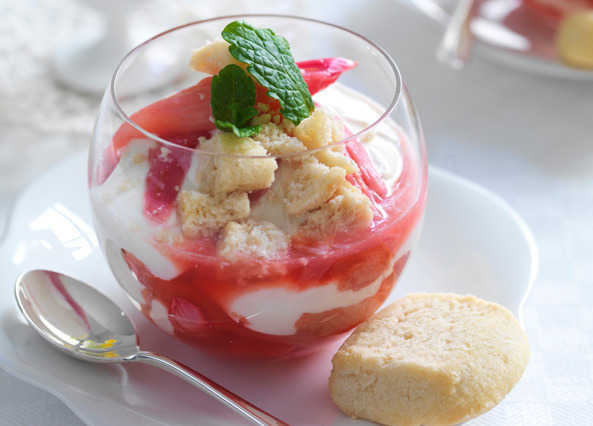 Another suggestion is to top with candied rhubarb. Enjoy! 1. Put the rhubarb in a pan with 4 tbsp sugar and heat gently, covered, until tender. Uncover, turn up the heat slightly, and allow some of the juice to evaporate. Taste for sweetness, adding more sugar if necessary, then drain the rhubarb, reserving the juice. Allow to cool. 2. Whip the cream until it forms soft peaks, then stir in the yogurt. Fold in the cooled rhubarb, and chill for at least an hour. Top with reserved rhubarb juice just before serving, if desired. This entry was posted in Recipes and tagged cream, fool, fruit, rhubarb, tart fruit, traditional recipes by Jennifer Moore. Bookmark the permalink.